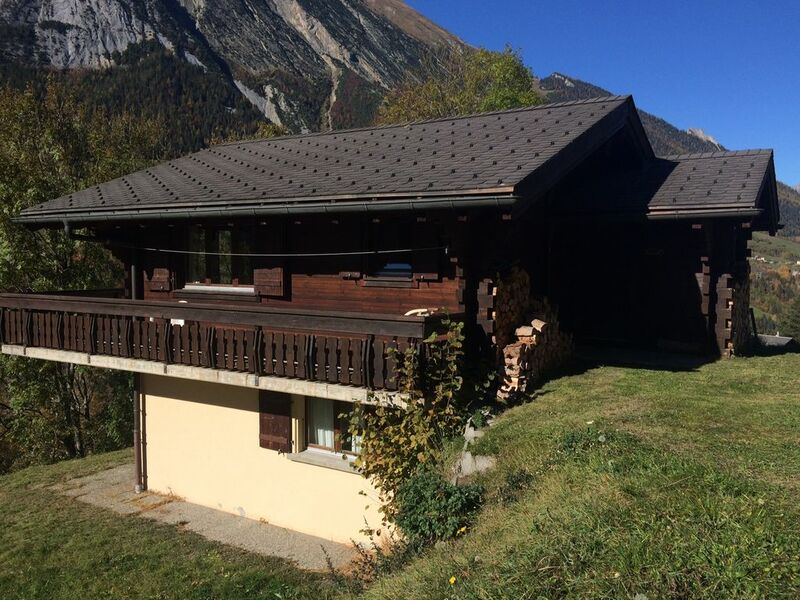 Well equipped holiday home chalet on sunny hillside overlooking Orsières, midway between Martigny and Grand St Bernard tunnel to Italy. The major ski resort of Verbier is 15 km away and several minor resorts are within 20 mins drive. All four seasons offer a contrasting and splendid location for regular or first time visitors. Comfortable accommodation for six people. Chalet includes fireplace, fully equipped kitchen, English satellite television programming and quiet surroundings for your relaxation needs. Convenient access to several nearby resorts and sites, though car is recommended. Close to both French and Italian borders. Driving Distances: The French and Italian borders are within 30 minutes drive. Shopping at Orsieres (3 mins) and Martigny (20 mins). Other driving distances: Geneva 1 hr 20 mins, Zurich 2 hrs 30 mins, Milan 2 hrs 30 mins, Calais 8 hrs. Bathrooms are clean and in good condition: one attached to master bedroom; second bathroom upstairs and includes a shower enclosure. Parking is available on the road. We do not recommend driving down the final 20m stretch to the chalet, especially if the ground is wet. Wifi Internet. Password is written on the Wifi router in the living room. Living room with fireplace, with sufficient seating for at least six people. Plenty of plates & cutlery. Fully equipped private open kitchen. Large (extendable) dining table comfortably seats six people. Cable with channels in English (BBC & ITV), French, German and Italian. South facing balcony with ample afternoon sunshine. Access to the chalet involves walking a short (approx. 10 metres) slope from the parking area and therefore may be unsuitable for those with walking difficulties. Otherwise it is very accessible with clean, swept roads, even after snowfall. Very cosy chalet - we had a lovely time. There are lots of things to do in the area with children. Water park, skiing, hiking. Would definitely recommend this chalet! We had a very restful holiday-week in winter-season. Possibilities for skiing, snowshoeing, shopping nearby, however calm and sunny, with a superb view to the opposite side of the valley. Though the bedrooms were small, the living with fireplace was quite cozy after daily activities. The kitchen was well equipped, but could have been pre-cleaned better. Altogether, this is a fine holiday-place to recommend. We're coming over here for years now and this facility has it all. Nice fire-place, cooking facilities, a living room with an amazing view, very clean. It's the perfect place to come over by car when you want to do some skiïng but don't want to be around the buzy (and expensive) skiïng town Verbier. The place to be if you want to get some rest and bring your mind in peace again. Nous adorons ce chalet que nous avons découvert cet été 2018. Il est spacieux et offre une vue splendide. Qu'il pleuve, qu'il vente, qu'il y ait du soleil, on est dépaysé et ressourcé. L'endroit est très calme et entouré de nature. Il y a tout ce qu'il faut dans le chalet. On apprécie la confiance du propriétaire qui nous permet d'arriver et de partir quand on veut. Nous avons été accueilli par des lits préparés, un chalet propre et rangé. Comparé à cet été, les housses des fauteuils ont été refaites, un nouveau frigo a été placé ainsi qu'une machine à café (avec d'excellents petits nespresso mis à disposition), tous les draps, couvertures et essuies ont été rangés avec des étiquettes qui indiquent où va quoi. Merci pour ces améliorations et cet accueil ! Il y a de nombreuses randonnées à faire et les enfants ont découvert le ski à la superbe station La Fouly, à 20 minutes du chalet. On se donne rdvz dans un an, même chalet, même période :-). A bientôt! Associé à un temps fantastique, ce séjour a été très apprécié par toute la famille. Located in French speaking Switzerland, the chalet is under an hour away from both France (Chamonix) or Italy (Aosta). Closest town is Orsieres (5 min drive / 30min walk), with Martigny approximately 20 minutes drive away. The chalet is in an ideal location to 'get away from it all', surrounded by plenty of hills and walking trails. Though not on the doorstep of any ski slopes, it is not a far drive away from well known sites such as Verbier, Grand St. Bernard, Champex (and Val Ferret), or even several slopes across the border in Italy. Ski: The following ski resorts are within 30 minutes drive: Verbier, Champex, Vicheres, Liddes, Val Ferret and Grand St Bernard, with cross country skiing at Val Ferret. Nearby you can enjoy superb alpine scenery, walking, boating (at Champex), rock-climbing, mountaineering etc. Rentals should ideally start Saturday for easy slotting reasons - and weekly rentals are preferred for the same reason (it's hard for us to rent out gaps). However, please ask if you have any specific requirements, we might be able to accommodate.